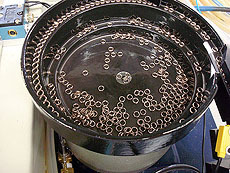 Application: Automatically Feeds and Installs: Brazing Rings, Coils, Washers, Snap Rings, Solder Rings, Spiral Retaining Rings onto Tubing or Parts. Visumatic leads innovation again with the Automatic Ring Application System, unavailable anywhere else on the market. 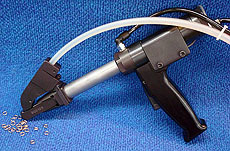 Using the combined principle of Visumatic’s VIN Pin Insertion System and Locking Bit, the VIN-R Ring Application System is designed to automatically feed individual rings like brazing rings, soldering rings and coils onto tubing or customer specified part, completely eliminating arduous and labor intensive hand placement. This evolution of our exclusive automatic Pin Insertion System allows the operator sensory feedback in order to feel the part and ring connection prior to actuation for maximum assembly efficiency and accuracy.